For the longest time, all I saw in this photo was those 4 gorgeous little people. Focus on them – aren’t they cute 🙂 However, change the perspective and that photo changes completely. I know that you can see a lot more than the kids. 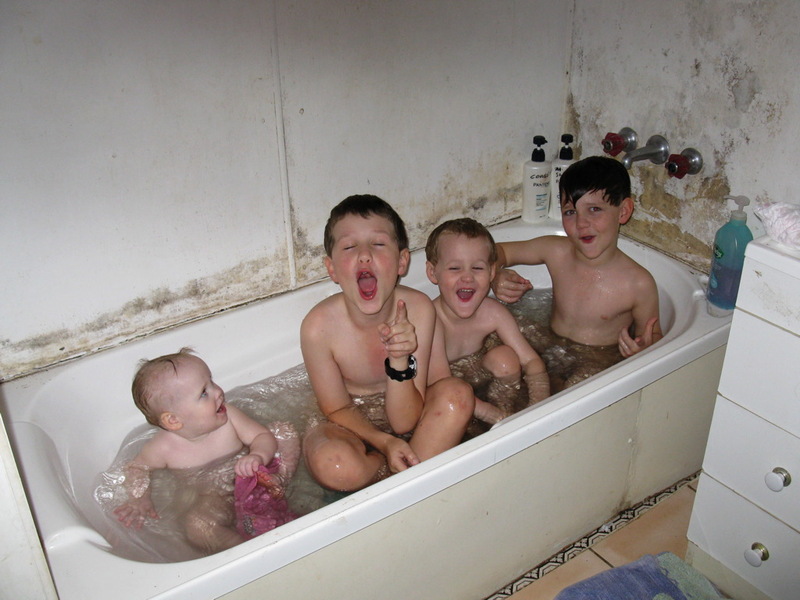 You can see that gross disgusting mouldy wall behind them. I also know this means you’re now going to have a second look. Yuk – and I’m squirming! Last week, I saw a TEDtalk by Dan Phillips. He is a designer/builder who makes homes from recycled materials. In his talk, I heard him challenge the notion of perfection. He uses imperfect items to create wonderfully artistic, quirky and challenging pieces. From that talk, I decided that we didn’t need to wait until we could do a full bathroom renovation, we could and should make do with what we already have on hand and get it sorted. After all, if we don’t like it, or it doesn’t do the job, we can still fix it! This led to project “colour my bathroom”. The only paint we had were crazy bright colours, and small sample pots of each. However, I was not going to be deterred. 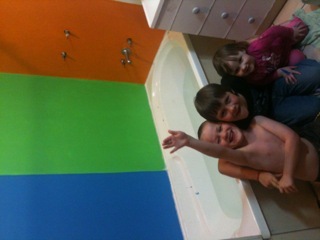 The bathroom needed fresh paint, we had paint, and we should use it. As Dean and I were scraping and scrubbing away that revolting surface, it struck me that this was pretty symbolic for me. Are you like me? Do you sometimes avoid the mould in the background and focus only on what you want? Focussing on what you want, or the positive aspects of life is a philosophy that is suggested to us by many teachers and philosophers. However, despite the focus, the mould is still there. So, time for me to get down and dirty and clear out some mould. For me this means that I don’t need to wait until I have all of the answers, and all of the plans ready to implement. It is more important that I tackle the “muck” with what I have available, and if later on I don’t like it, I can do it again. Here’s to not just ignoring the festy bits, making do with what I have and what I know, and the freedom of believing that imperfect is completely A-OK!! Love the new wall Kathryn and have found your blog an interesting read so far-so keep up the good work! Although it is a bit of a purge for me, I sincerely hope it helps to shine the light on the demon of perfection (which inevitably holds us all back) and allows us to focus on our best futures! Always a good read Kathryn. You are getting good at this.